There is ample awareness about mobile penetration, and an increasing number of users now getting online through their mobile phones. However, there is still hesitation on how real these numbers are and what the audience is doing via mobile internet. Compiled here is pieces of research and reports, akin to those of a jigsaw puzzle, that when put together give a clear idea on how much is the penetration, what is being accessed on mobile internet, why these numbers can go up, where is it going, and which way should your digital marketing plan be headed. According to the last report of IAMAI and IMRB, of the total 150 million internet users in India, there were around 87.1 million mobile internet users till Dec. 2012. 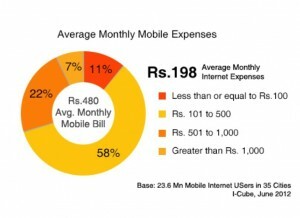 What’s more, on an average, a mobile internet user spent about Rs 198 towards internet expenses. In recent (mid-2013) web analytics we have observed that brands and corporates including NGOs, B2C and B2B categories, that are not updated with mobile friendly content get an average of 10 per cent of traffic on websites as well as Facebook. Clients ready with device agnostic pages and content, traffic from mobile is rising and hovering between 20 per cent to 25 per cent. According to the latest report of Telecom Regulatory Authority of India (TRAI), till January 2013, the total wireless subscriber user base was 862.62 Mn of which 708 Mn i.e. 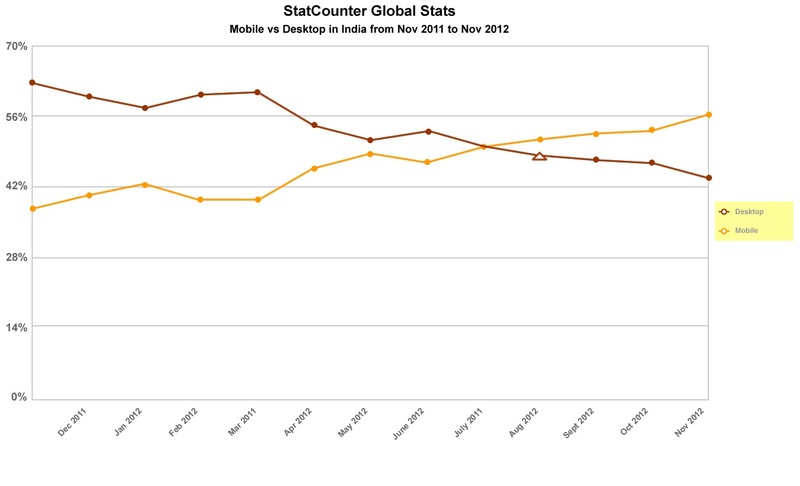 82.08% were active mobile users. However, as analysed by GSMA Director General Anne Bouverot, on an average, each user has 2 sim cards and in terms of unique number of subscribers, there are about 380 million actual users – about 26 per cent of the total population. McKinsey Research forecasts that the total number of Mobile Internet users will increase more than five-fold to 450 million by 2015. Another recent report by Boston Consulting Group stated that the total number of Internet users in India is expected to increase from 125 million in 2011 to 330 million by 2016. The report noted that, at present, around 45% of online consumers in the nation use only the mobile to access the Internet. This is expected to increase to 60% over the next three years. India’s only official internet and mobile association – IAMAI is the most conservative in the projections expecting the number of mobile internet users reach 130.6 million by march 2014 and 164.8 million by march 2015. Google and Bharti Airtel are encouraging trials to catalyse the adoption of mobile internet. Airtel mobile customers in India can freely access Google online products, including the first page of a Web site linked from search results. Customers will be prompted to purchase a data pack if they click a second link on the Web site they reached via a Google Search, or if they need to download attachments from Gmail. Vodafone India recently slashed its 2G Internet tariff by 80 percent to 2 paise / 10 KB from 10 paisa / 10 KB earlier. Vodafone also introduced ‘One Time Trial Packs‘ in April this year for 2G and 3G at very affordable price points of Rs 25 for 2G and Rs 49 for 3G, together with a 500 MB data transfer package. The intent is give its customers a taste of mobile Internet and its advantages at price points that a customer won’t think twice to say yes to. A Financial Express feature reported that at eBay India today, every one minute a mobile accessory changes hands and every two minutes a mobile handset. It has 4,306 e-commerce hubs today, of which 1,015 are hubs in rural India, indicating that consumers in the smaller towns of India are a major force in this online growth story. An I-Cube Survey in June 2012 reveals a wide range of uses of mobile Internet. 49% of people who are using the mobile Internet either never, or infrequently, use the desktop Internet. India has emerged as the 2nd largest base of mobile only Internet generation after South Africa. If you look at smart phone penetration, and since smart phone users are most likely to access the internet, Mary Meeker’s (partner at Kleiner Perkins Caufield & Byers (KPCB) and former Internet analyst) latest report on Internet Trends in India suggests that we will have 67 million smartphone subscribers by the end of 2013, recording a 52% growth YoY. – Only 6 per cent don’t use their phones to connect to the web. – 94 per cent smart phone users use the phones to connect ot the web. – 40% surf the Net at least once a day. – 32 per cent read newspapers or magazine. 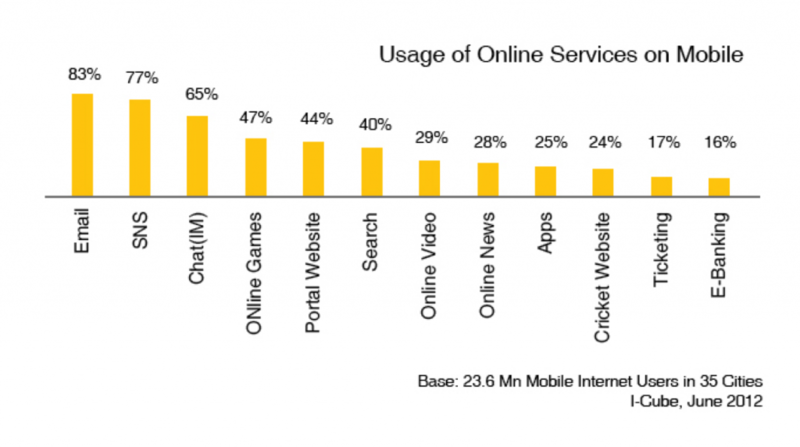 DOES YOUR DIGITAL MARKETING RUPEE CONSIDER MOBILE INTERNET USERS? If you are building a website today, but are not planning on revamping it for the next 5 years at least, then you need to prepare not just for the internet user today, but also those who will visit your site over the next five years. If you are doing Facebook marketing, posts may be viewed on the mobile, and have to be optimized for mobile screens. And if you are doing a Search campaign, on the go search is very likely to be the most popular approach from the difficult to reach target consumer, reaching him or her on the mobile may be critical today. To maximize your ROI, it is time to have a device agnostic approach to your content, creative and media strategy.